Chances are, at one point or another you’ve used a sports related expression in a decidedly non-sports context. Some obvious ones are inside baseball, political football, and soccer moms. Others are less well known: go-to guy (basketball) and dead ringer (horse racing) for example. Sports journalist and former baseball player Josh Chetwynd has compiled what appears to be an exhaustive collection in his new book The Field Guide to Sports Metaphors: A Compendium of Competitive Words and Idioms. Here are the sports-related origins of just six of the over 300 terms included in the book. While there is circumstantial evidence of the word previously being used in the American South as a sexual reference, it first appeared in print in a 1912 Los Angeles Times article about baseball. Ben Henderson, a pitcher for the Portland Beavers, touted a pitch he called a “jazz ball." In a San Francisco Bulletin article a year later, writer E. T. “Scoop” Gleeson used jazz in reference to the “pep, vim, [and] vigor” of the San Francisco Seals players during spring training. Gleeson continued to use the word during his coverage of the baseball season. When asked where he had heard it, he said it was another reporter’s term from the dice game craps. The team’s hotel that spring in 1913 was also home to a group of musicians hired to entertain the guests. It’s almost certain that the band led by Art Hickman interacted with Gleeson and the players, thereby picking up the jazz lingo. Hickman wasn’t a fan. However, his banjo player Bert Kelly liked it so much he used it to describe the sound of a new band he formed a year later in Chicago. By 1915, the Chicago press was full of musical jazz mentions, with New Orleans based publications following suit in 1916. As for baseball mentions, Gleeson’s 1913 efforts didn’t catch on in subsequent seasons. The word flaky was in use as far back as the 1920s to describe cocaine (the substance being “flaky in appearance,” according to Eric Partridge's A Dictionary of the Underworld). However, it was in an apparently drug free context that the word was used to describe the odd personality of outfielder Jackie Brandt in the mid-1950s. According to Chetwynd, “the rationale for the moniker was that his mind was so impermanent that his brains were flaking from his head." Brandt’s on-field antics included hitting a home run and sliding into each base (rather than simply jogging around). The use of flake as an “insider’s word” in baseball was also noted in a 1964 New York Times article: “It does not mean anything so crude as 'crazy,' but it's well beyond 'screwball' and far off to the side of 'eccentric. '“ However flake came about, Brandt was reportedly proud to be called one. While the expression is used today in many contexts and is not uncommon as a song or album title by numerous groups, in your face first gained popularity through basketball. It was a “phrase to be uttered after making a shot or defensive play that humiliates an opponent” according to a 1980 book on America’s best pickup game spots appropriately titled The In-Your-Face Basketball Book. By the early 1990s, the phrase had entered mainstream political discourse. It was the subject of a 1992 William Safire “On Language” column in The New York Times Magazine prompted by a reader who was unaware of its meaning. Safire approvingly quoted assistant executive editor Allan M. Siegal complaining that it had “catapulted overnight into the cliche Hall of Fame.” Siegal’s complaint would go unheeded: In your face continued to show up in a steadily increasing number of New York Times articles over the next two decades. The word fluke has three distinct meanings in English. One is for “the flat end of an arm of an anchor.” Another is for the flatfish also sometimes called summer flounder. Both of these have straightforward etymologies. Of somewhat more uncertain origin is how fluke came to mean an unexpected stroke of luck. What we do know is that it first appeared in the mid-1800s as a billiards term. At the time, pool required a considerable amount of luck due to the warping that occurred on the old ivory billiard balls. That, combined with the fact that in Old English fluke means "guess," provides a strong indication of how it came about. By the 1880s, it began to be used in other contexts. It wasn’t long before more sustainable—and more durable— materials began being used for billiard balls, thereby minimizing the need for flukes by more skilled players. The word seems to have originated in 17th century Scotland as a way to refer to someone who couldn’t see something well. Fast forward to the 1800s, and this definition made its way into golf parlance. At the time, a golfer could only pick up an obstructing player’s ball if they were within half a foot of each other. Hence the first known citation from an 1834 rule book in Scotland: “With regard to Stimies the ball nearest the hole if within six inches shall be lifted.” It appeared as a verb 20 years later in an 1857 monograph about the sport: “The ball stimying may be lifted if within six inches of that of the player, until the stroke is done.” By the early 20th century, stymie began to be used outside of a golf context in its modern manner. In 1952, as golf expanded in popularity beyond the British Isles, associations on both sides of the Atlantic published their first unified rulebook. During this process, the stymie was abolished from the game altogether. Today, free-for-all carries a somewhat chaotic and negative connotation. It wasn’t always so. In 1700s England, a free-for-all was a horse race open to anyone who wanted to enter. They weren’t open to literally everyone, but the name stuck anyway and it made its way to the U.S. It was during the mid to late 1800s that the American press began to refer to large public skirmishes as free-for-alls. How one meaning transformed into the other remains a mystery. 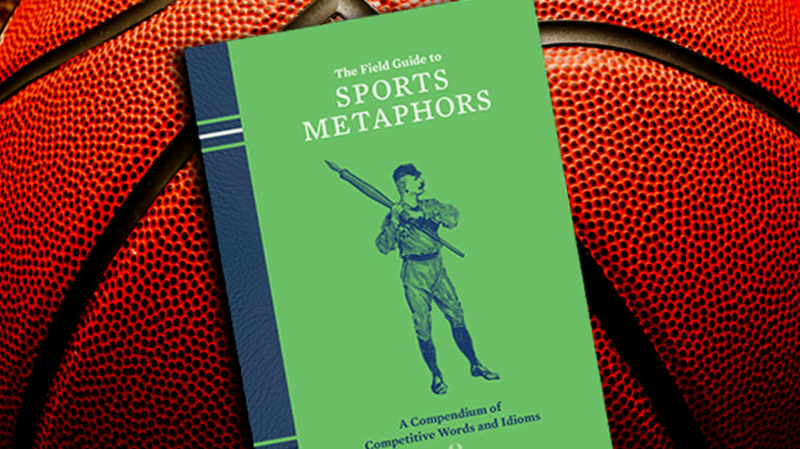 If you’d like to explore more sports metaphors, check out The Field Guide to Sports Metaphors: A Compendium of Competitive Words and Idioms.